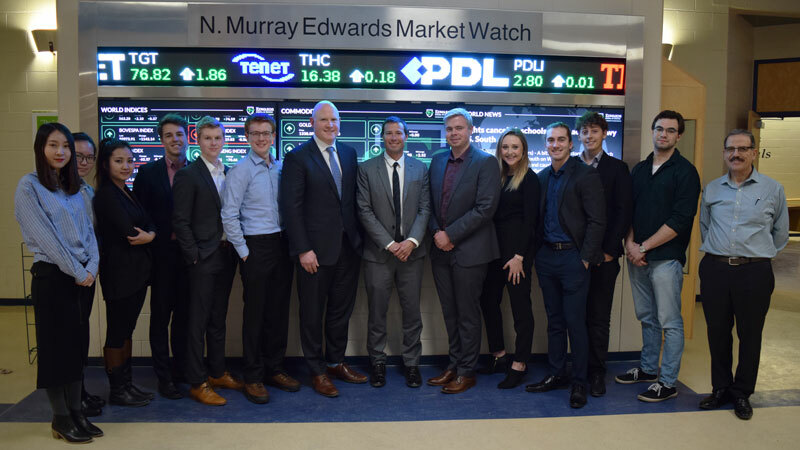 The Dembroski Student Managed Portfolio Trust, a student-run investment portfolio at Edwards School of Business, recently hosted guest speakers from PrairieSky Royalty Ltd based out of Calgary. President & CEO Andrew Phillips joined COO Cameron Proctor during the visit to Saskatoon last week. As part of the campus trip, the leadership team generously donated their time and knowledge to the COMM 371 & 471 class taught by Dr. George Tannous. PrairieSky is the leading mineral title owner in Saskatchewan and a large employer of University of Saskatchewan graduates. Since inception in 2012, the Dembroski Trust has delivered significant experiential learning opportunities to Edwards students as they put their core knowledge into practice managing funds in an investment account. Another practical element of the course is the opportunity to learn from visiting financial professionals. “The student-managed portfolio classes enrich practical experience significantly and open new horizons for student interactions, guest speaker presentations, and industry participation,” commented Professor George Tannous, faculty advisor for students. And that’s just what PrairieSky brought to the table with their presentation which focused on the duo’s advice, real-world stories, and personal experiences in addition to an interactive Q&A session with the class. “Having energy professionals Andrew and Cameron present on PrairieSky Royalty and offer their time and expertise provided great value to the overall practical learning aspects of the Comm 371 & 471,” said fourth year finance student Jillian Hemstock.